Superior Standards Have Set Apart the Palmwood Name. Welcome home to a better way of life with our Casita Series' 9-12ft ceilings, luxury bathrooms, precision designed kitchens, and energy-efficient features. These award-winning homes capture all that's best about Florida living. Palmwood's Casita Series combines the classic elements of solid architecture with innovative design, executed to superior standards that set apart the Palmwood name for five decades. Welcome home to a better way of life with our 9-12ft ceilings, luxury bathrooms, precision designed kitchens, and energy-efficient features. These award-winning homes capture all that's best about Florida living. As a custom builder with a Designer on staff, we sculpt your home to be your personal masterpiece, gracing each detail with quality. The Original Nature Coast builder of the unforgettable Cabana courtyard home, Palmwood invites you to experience this unique home that wraps around you creating your own exotic getaway. These Cabana designs, with their private courtyard and separate guest suites, come in a wide variety of sizes and options. In addition to our Traditional & Courtyard homes, Palmwood's design portfolio includes stilt & beach homes, handicap accessible, and palatial estate homes. Bring your own ideas and we'll take it to the drawing board or adapt one of our 90+ architectural designs to create your custom dream home. View more images of this home. 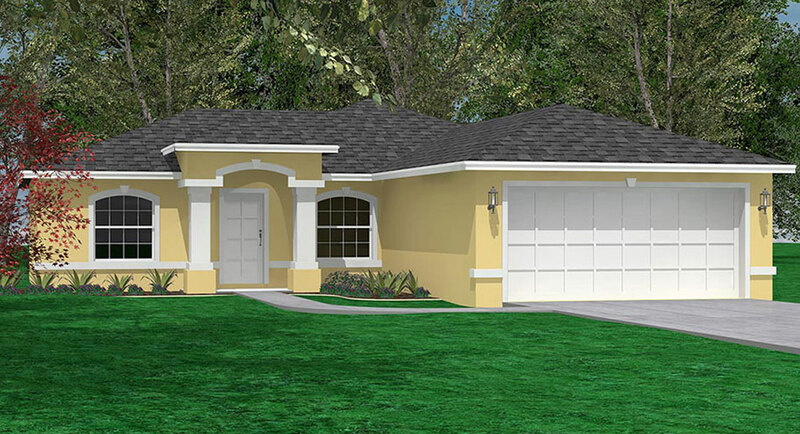 The Bimini Breeze is a beautifully designed, zero lot line hybrid cabana style home. It is a spacious and open design for small lots while still giving you a home for living the Florida lifestyle. 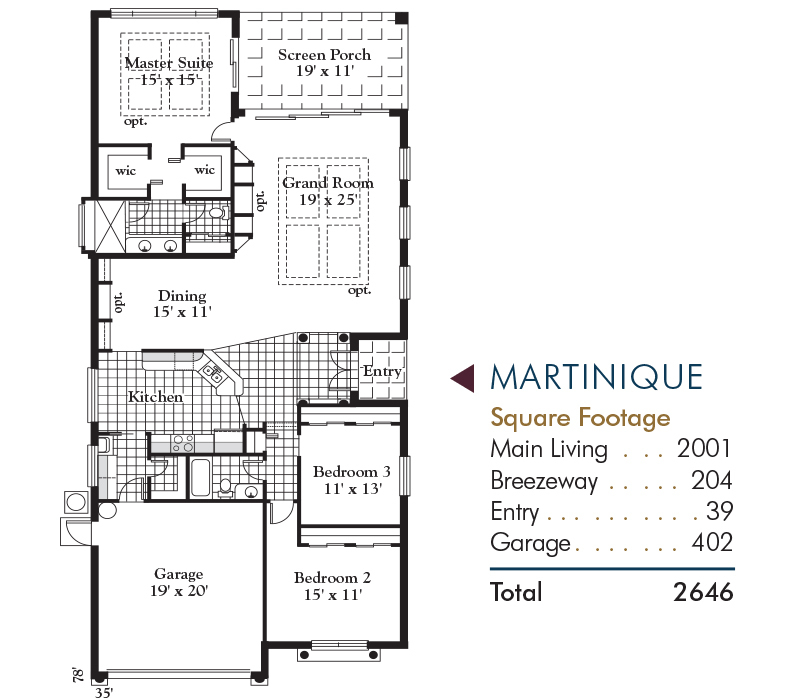 The layout includes 3 bedrooms separated into 3 quadrants. There is a side entry into the home. There’s plenty of room for cooking and entertaining with the expansive kitchen that opens to the Leisure Room and private pool area. The exclusive dining gives you even more room for enjoying friends and family. 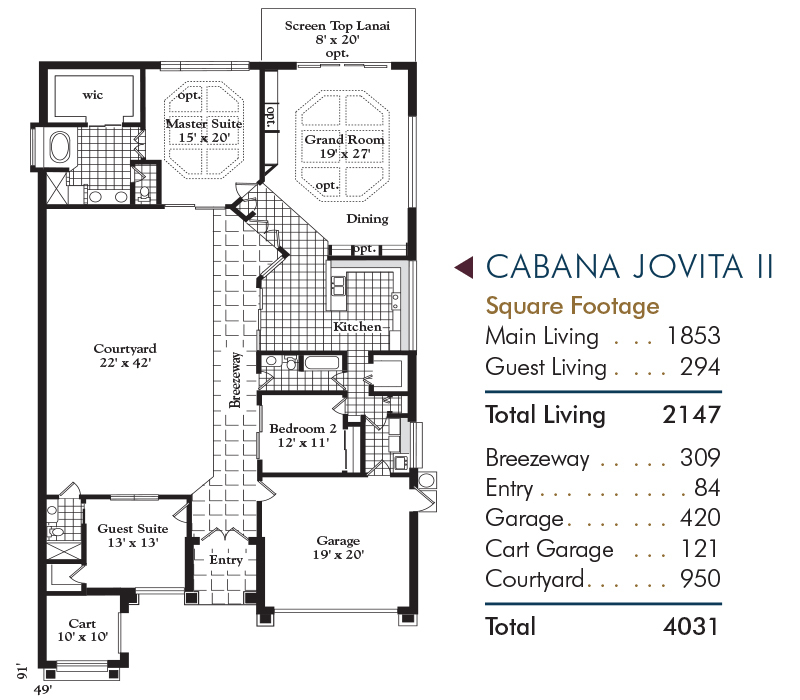 The Cabana Jovita II is an elegant and distinctive home built for a narrow lot. The design, amenities and layout are similar to Tampa Bay’s most unique and award-winning Courtyard Resort Homes. The Cabana Jovita II includes Golf Cart garage that can also be converted to a secluded office with exterior and interior entrances. You will enjoy all the beauty that Florida living offers with views of the private courtyard paradise from every room in the home. You’ll enter the home through a gorgeous brick-paver lined Breezeway with raised cantilever trusses. 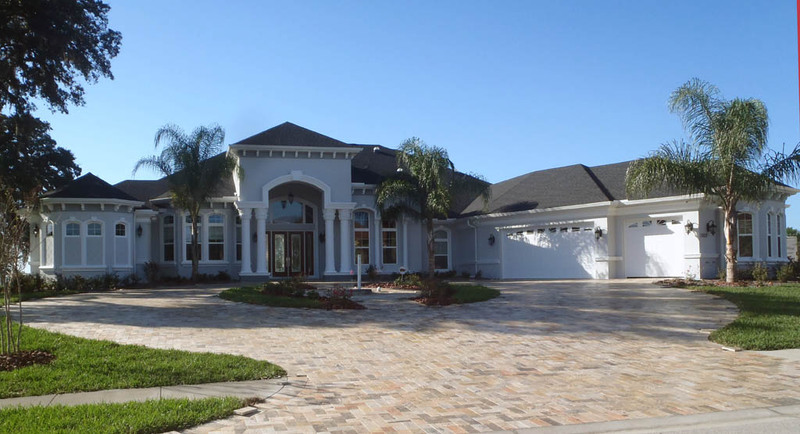 When you say you want to live in paradise, this home gives you Florida lifestyle at its best. The Martinique is our most sold Casita Home Design. It is perfectly designed to give you maximum square footage while sitting on a narrow lot. The layout includes a split plan with beautiful double entry doors located on the side to further separate. You’ll enjoy the elegance of the raised foyer ceiling with columns and crown molding. These touched truly give the home a luxurious feel. One side of the home has an isolated and quiet Master Suite. The Master Suite is perfect Florida living as it overlooks a rear screen porch. You can enjoy entertaining family and friends with the Grand Room opens to a beautiful island kitchen with walk in pantry. You won’t believe all the details and beautiful work that are included with the Martinique Villa. 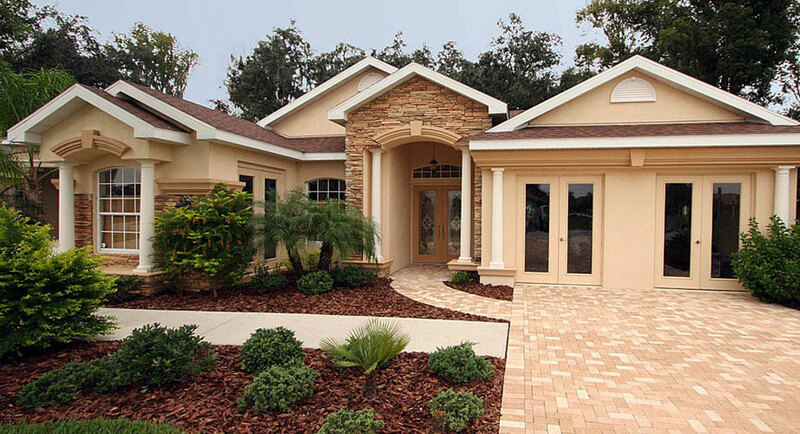 The St. Lucia is a Florida home design masterpiece. It is 2 stories with 4 bedrooms. You’ll love cooking and entertaining in the luxurious, designer kitchen with nook, island, pass thru and walk in pantry. The first floor Master Suite is sheer elegance with a glass enclosed meander through double shower and garden tub. The second floor has a flex, gathering balcony space which overlooks the beautiful Grand Room with optional Fireplace. 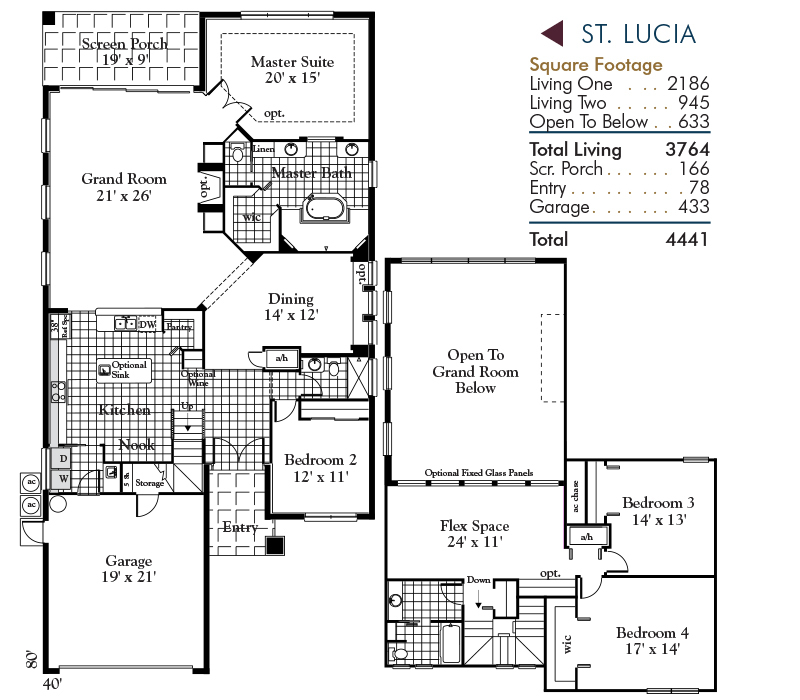 The St. Lucia is paradise elegance in a home design. 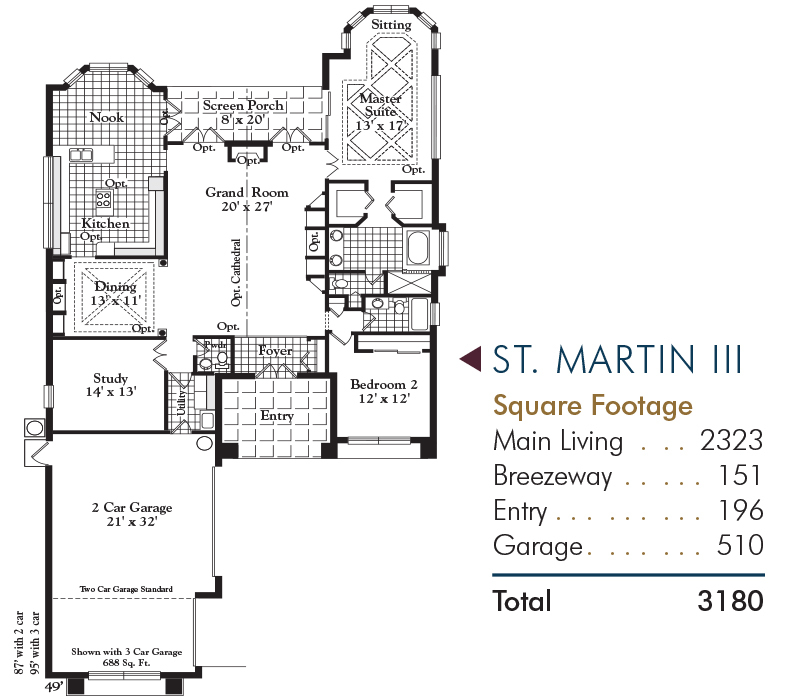 The St. Martin III Home is built with great amenities to fit your Florida lifestyle. You’ll immediately notice the 3-car or golf cart courtside entry garage. When you enter the home, you will be wowed by the voluminous Entry. You’ll enjoy more luxurious living with the Grand Room and optional fireplace and French doors. If you like to cook and entertain, you will love the massive island kitchen with breakfast nook and bay windows. You can already imagine sipping your coffee and watching the sunrise. The elegance continues in the Master Bedroom which includes a sitting Alcove, soaking garden tub and raised planter window. 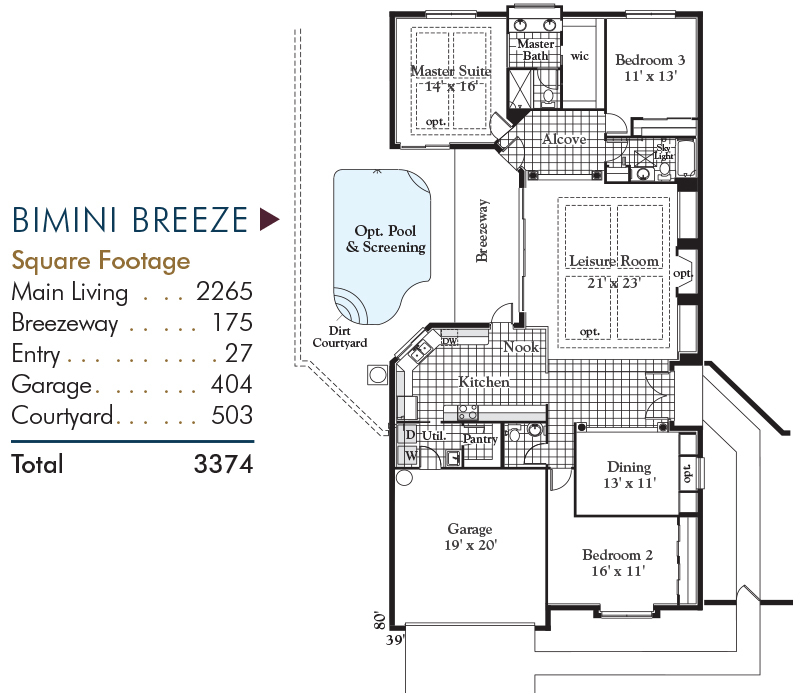 The layout includes 3 bedrooms in 3 quadrants of the home. You can also add an optional powder bath. 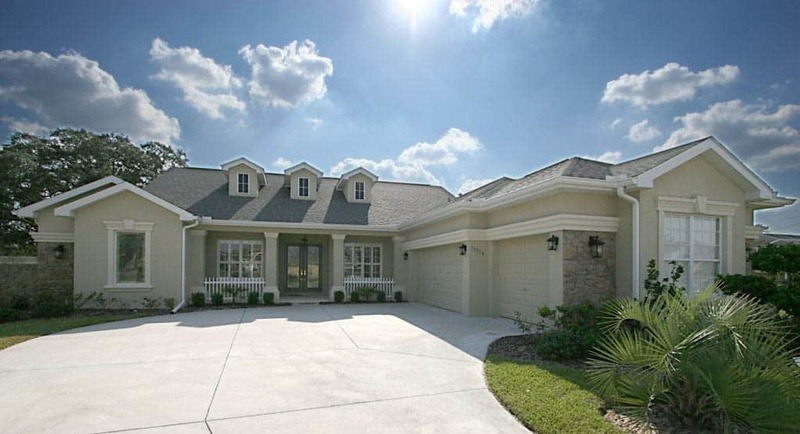 The St. Martin III is everything in elegant Florida Nature Coast living.